A roll of corrugated cardboard paper 300mm wide x 75 Metres long. Perfect for protecting your items thoroughly for transit, and for corner edge protection. 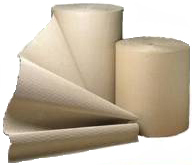 Most commonly after bubble wrapping, as used in many trades such as furniture, large electric appliances etc.